Development is a discontinuous and spontaneous change in the stationary state which, forever alters and displaces the equilibrium state previously existing, while growth is a gradual and steady change in the long run, which comes about by a general increase in the rate of savings and population. Economic development deals with the problems of underdevelopedcountries, whereas economic growth deals with the problems of developed countries. Prof. Maddison is of the view that, “The rising of income levels is generally called economic growth in rich countries and in poor countries it is called economic development, which is the outcome of deliberate planning”. Thus, the term economic development is used for the fuller utilization of unutilized natural and human resources ofthe underdeveloped countries, while the term economic growth is referred for maintaining the situation of full employment in developed countries. Economic Development means changes such as social, economic, and other changes which boost economic growth. Economic growth is measurable, but economic development cannot be precisely measured. In the opinion of Robert Clower growth is possible without development. Economic growth may not have any percolation effect on the society. It may bypass the people. Growth can be jobless and ruthless. It may not bring real prosperity and social welfare. People’s standard of living may not rise due to higher economic growth. On the other contrary, the process of economic development has favourable effect on economic growth. These differences show that there are no water tight differences between economic development and economic growth. Economic growth is a Economic Development quantitative measure of development, while economic development is both quantitative and qualitative measure of development. Today’s economic development can be tomorrow’s economic growth. Most often we loosely refer only to ‘growth’, and, occasionally, for the sake of variety to ‘progress’ and ‘development’. However, Gills et.al. 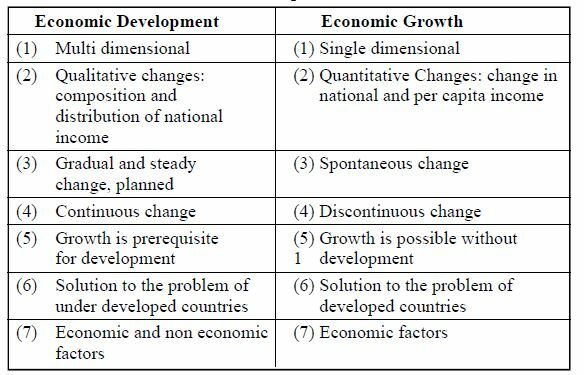 (1996) said that the term economic development and economic growth are sometimes used interchangeably, but there is a fundamental distinction between them. Economic growth refers to a rise in national or per capita income and product, but economic development implies fundamental changes in the structure of the economy.